8 1/2” x 11“ FALL/HOLIDAY This particular catalogue has a double cover. 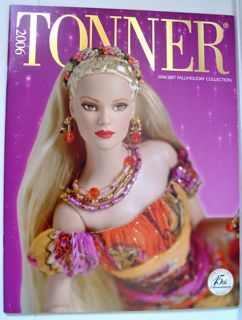 One cover (as shown) Tonner and the other side is Effanbee. This catalogue includes the Fashion Doll lines; Tyler, Marley, Betsy McCall, American Models, New York City Ballet, Wizard of Oz, Alice in Wonderland, Mary Engelbriet, Memoirs of a Geisha, Cinderella, Mrs. Claus. Brenda Starr, Dy Dee Baby, Patsyette, Toni, Wee Patsy, MrsWillowby’s and Katie.